So I'm trying to come back to the present/catch up, but there's a lot I've missed in the past 3 weeks! 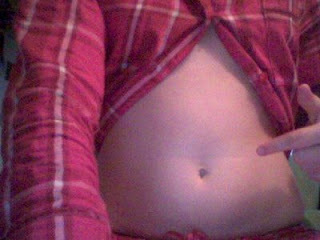 Amanda's Belly(from her blog...click-y the pic-y). To sum up, Roadrunner wanted Amanda to fix/change/edit her video for Leeds United because they said that her belly was not attractive. I read the story from The Guardian through a link in Neil's blog and you can see her post about it in her blog (that link's on her belly pic above). I think her belly looks fine! I think she looks GREAT! What the hell are they on about?! That is one of the many reasons as to WHY I love Amanda Palmer.